Sometimes a Director of Photography may prefer to use an 81EF rather than an 85. When used alone in daylight, this filter under-corrects tungsten balanced film and provides a cool or bluish look. However, if an 81EF is used with tungsten balanced film in tungsten light, it results in a warm look. It's Autumn. The clouds are low hanging and the sky is "patchy blue". You've gone for a ride upstate to the mountains and the light in open shade is bluish. A photo taken of your girlfriend with daylight balanced film leaning against the side of a barn will yield bluish tones that she might not find particularly flattering. 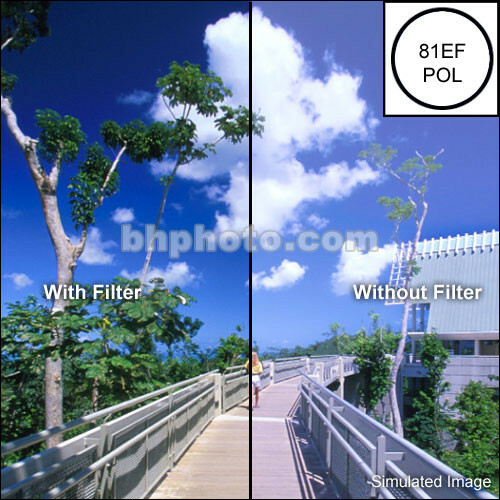 An 81EF filter (the strongest in the 81 series) will more than replace the yellow missing from the image and place all skin tones on a distinctly "warmish" level. You might even consider using an 81EF at the beach to make a hot scene even "hotter". The 81 series allows you to choose how much warmth you wish to replace in the image. Linear Polarizing filter Light rays which are reflected become polarized. Polarizing filters are used to select which light rays enter your camera lens. They can remove unwanted reflections from non-metallic surfaces such as water or glass and also saturate colors providing better contrast. The effect can be seen through the viewfinder and changed by rotating the filter. The filter factor varies according to how the filter is rotated and its orientation to the sun. Note: Linear polarizers are used with most video and manual focus photo cameras. They are not recommended for auto-focus SLR cameras. Circular polarizers are specifically designed for use with auto-focus SLR cameras (They will also work on manual systems and video cameras without problems).